In rainy Florida, hurricanes can wipe a business' data away in a moment. 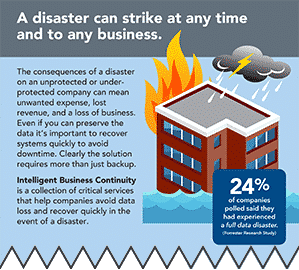 Is your backup prepared for the unexpected? We’ll keep you connected to your data – whatever happens – and more importantly, we’ll give you peace of mind. Priceless. 70% of businesses that suffer a serious data loss are out of business in two years (source). If you are tired of broken backups and failed restores, take a look at CompuSys Business Continuity solutions. It is is our suite of Best–of–Breed intelligent managed backup and disaster recovery solutions. Whether you are fully virtualized or using physical servers, continuity will smooth out the ragged edges often left by obsolete, outdated, poorly supported, and otherwise inadequate backup systems. Sign up below for a Free Backup & Disaster Recovery Evaluation.